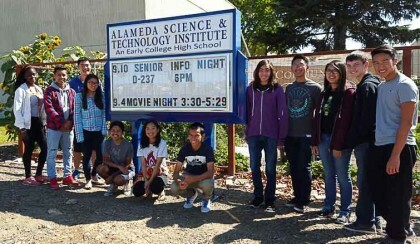 The Alameda Science and Technology Institute (ASTI), an Early College High School partnership between the Alameda Unified School District and College of Alameda, one the four Peralta Colleges, has won a 2015 National Blue Ribbon Schools Award. The award, which is given out by the U.S. Department of Education, honors academically excellent elementary, middle and high schools. ASTI was designated as an “Exemplary High Performing School,” which means it is in the top 15 percent of schools statewide, as measured by various assessments, such as overall academic excellence and progress in closing achievement gaps among student subgroups. Only 29 schools (8 of which are high schools) in California received that designation. Across the country, only 285 schools received the award. “The College of Alameda is pleased with this much deserved, national recognition of ASTI,” said Joi Lin Blake, President of College of Alameda. “Research has shown that early college high school partnerships increase student access, affordability, achievement and completion. And ASTI is an example of the Peralta Community College District’s commitment to continued collaborative partnerships with our K-12 colleagues that promote and support student success,” Blake said. Pesident Blake also noted that ASTI 2015 graduating class had received $400,000 in scholarships. ASTI’s primary objective is to increase college readiness and retention among first-generation college-bound students and students from groups that are typically underrepresented on college campuses. The program allows students to enroll full-time at College of Alameda in 11th and 12th grade. As a result, about 40% of the students graduate with an AA degree, and 88% of the graduates meet the course requirements for attending a UC. The school was founded in 2002 and is supported by Measure A parcel tax money. Five of the eight public high schools chosen from California were Early or Middle College High Schools.